Edit: Shog9 already acknowledged this issue in a comment where he referenced Help us find duplicates efficiently on meta SE. Since that post is about 10 months old and nothing was changed, I'm skeptical about a future fix, but I see no reason not to try. 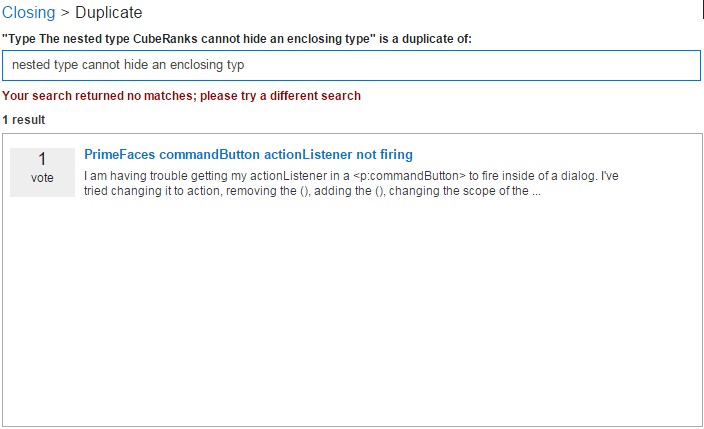 I believe that the search field used when selecting a duplicate can have its functionality improved. It is definitely not the same as the site search, judging by the different results they give. Alright, I didn't supply a lot of information yet, but at least use the tags in the question I'm closing: java and plugins (this one is completely unrelated to the question). Instead, I get xsd and xsd, .net and reflection, c# and .net and reflection, c++ and class and nested and forward-declaration etc. 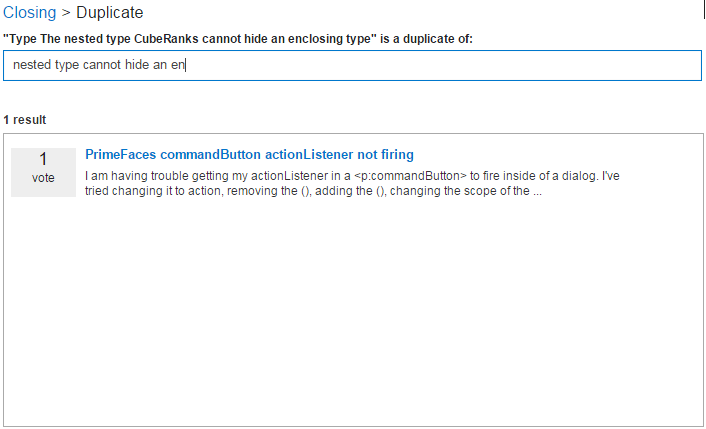 nested type cannot hide an en == PrimeFaces commandButton actionListener not firing ??? 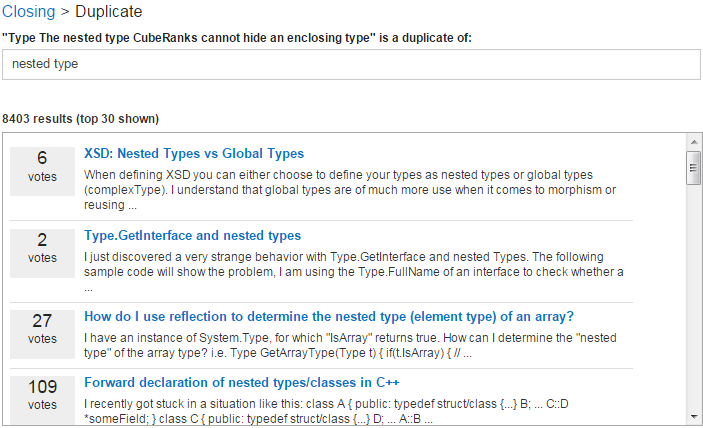 Not only that question is not tagged similarly, the words "nested" or "hide" do not even appear on that page. Where did all the questions go? Surely the target question I'm searching for should appear. Do I really need to spell it out (literally)? If I'm missing the final letter of the title then I get no matches (when such a message appear, the previous search results are left, they don't indicate anything about the current search). To be fair, the question does pop-up intermittently while typing, but not so often in the 4 visible candidates. Apparently, I'm not the only one suffering from this. I'm going to call this a bug because of the "blatant incompetence" displayed, but if this is by-design for some reason, then do make it a feature request. Edit 2: to all the users who post suggestions in the comments: please post them as answers. Telling me ideas in the comments won't help, I'll just say "go for it". Agreed. I am not that great with these type of questions but I will try my best. That should be simple. Duplicate questions should have most if not all of the tags the question in question has. There should be a very close relationship between the tags, like python and python-2.x. Tags that simply don't mix won't make the list unless there are other tags that match. Find the words used in the question itself with others filtered by the above step. Like in your example, the filter should try matching important phrases or words like nested type and en. All the other words are irrelevant and will make the search even worse. Come on, at least check if the title seems to have the same meaning of the other questions. Clearly, the examples you gave should give way better results and typing in the question word for word will be painful. If the title has a close relationship with other titles, use them. Why is str() giving me an error and Why is using str() raising an error is an example of closeness. Seemingly, slight differentiation of the wording will cause chaos. If there is a type of question usually that makes a lot more questions closed as duplicate, try those as well. Order of steps may vary and I probably skipped some major steps but this is my idea. The search should be better at locating canonical questions. Someone who uses this feature already strongly suspects the question is a duplicate of an existing question. Unless they have a prodigious memory, this must be because the question is a duplicate of a FAQ with a canonical question. Perhaps it should be biased towards FAQs (questions with many links, I think), highly up voted questions, and protected questions. I suspect the search engine can not do such biasing itself. Perhaps it could be done in a post processing stage. As using that search functionality is a privilege, it might be sheltered from the DoS danger of such post processing being generally applied. Not the answer you're looking for? Browse other questions tagged bug duplicate-questions search .